New to dance? While many like to start with a few private lessons to get their minds and bodies in gear, you are welcome to join any Beginner-level group class any time you wish, with or without a partner. $80 - for a 6-class punch card. Come to any group session you like, M-F.
Rumba Basics 2 - starting in March -- six, 1-hour group classes will teach you several new movements to add to the excitement of this fun dance. American Tango Basics 2 -- starting in March -- six, 1-hour group classes will teach you several new movements beyond Basics I, building your your skills and enhancing your enjoyment of this beautiful dance. Join on any date and your lesson plan will carry on until you finish 6 lessons. 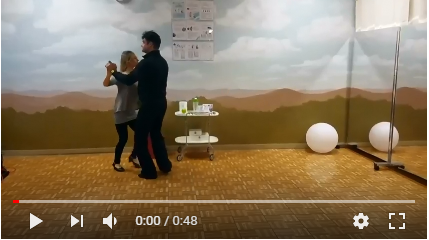 $432 for six, 1-hour private Latin Basics or Ballroom Basics – for individuals, a couple, or up to 7 people. Call (207) 671-7644 to schedule. These six, 1-hour group classes will teach you 3-5 movements in each dance style and get you comfortable on the dance floor. Synergy Fitness: learn 10-12 movements that will improve your balance, strength and enhance the way you move in a fun, interactive class. Basics 1: six, 1-hour group classes will teach you the 3-5 movements in each dance style and get you comfortable on the dance floor. Basics 2: classes build on this with an additional 3-5 movements. FOR ANY GROUP CLASS: Join on any date and your lesson plan will carry on until you finish 6 lessons. Note: our studio is large enough to run classes concurrently, and we can also give private instruction before/during/after certain classes. $432 for six, 1-hour private lessons – for individuals, a couple or up to 7 people. Watch for special classes & events! Competition Training -- Call for times - we will work with you to personalize a training regimen.